It’s important to have a good doctor, especially one for the precious kiddo. There was this one time Anne was ill and our doctor was closed. We went to the clinic next to his. The doctor prescribed antibiotics. It came in powder form and you had to mix it with water. It smelt like rotten eggs. Anne never drank a drop of the smelly stuff, and it took us many months to undo her phobia of medicine. Doctor Michael Lee at Spring Clinic (Old Airport Road if you’re interested) won over Anne’s heart by bribing her with stickers and a little toy hammer that squeaked. The best part about it is the medicine that tastes great. I know there’s a danger that Anne’ll think it’s syrup and what-not, but honestly, trying to get a child to drink a putrid-smelling concoction is a sure way down the road of absolute frustration. So, medicine tastes nice. Anne naturally asks for some from time to time. We explain that medicine can only be taken when she’s ill.
She looks at us, rubs her tummy and says, “I think…I’m not well”. We laugh our heads off. Anne giggles. She’s not even two and a half years old. I remember earlier this year I asked Kat if they were thinking of starting a family. They hadn’t, largely because of the uncertainty having a child brings - life as you know it is never, ever the same. And no one can tell you with any degree of certainty what the future holds. You’d think the fear goes away after the first; after all, the first time doing anything is always the most fearfully exhilarating right? The whole having-a-kid business is different every single time. This time round, Faith is retching every ten minutes and feeling nauseated 24/7. I feel so helpless watching her bear the burden. I try my best to make sure that everything falls into place - that she gets the food she wants to eat, that Anne is taken care of, that the housework is done, trash is dumped … and with the immense pressure building up at work thanks to a tight deadline and halved resources, I find my grip on everything slipping, and it freaks me out. I need to, as the old cliché goes, let God and let go. When I told Anne that there was a little baby inside of Faith, her reaction was absolutely classic. She looked at me, thought for a while, then said, “I don’t want”. Since she loves Addie’s baby daughter, I decided to attack from the flank. She totally ignored the question. Faith looked at me, and said, “She knows it’s a t-r-i-c-k q-u-e-s-t-i-o-n”. Design is intention made manifest through action. Design is not merely intent: that is the realm of abstract ideas and hypotheses. Intent alone sees purpose but serves none, advances no goals and creates no change. Neither is design only action, a hurried scampering that expends energy only to find itself exactly where it first began. Design is the convergence of the two, without which we would still lie in the primordial soup hoping against hope that something would come out of nothing at all. To me the best thing about all this web 2.0 fanfare is the push towards open information. RSS, mashups, Google - all made possible because of information sharing. The tricky bit arises when drawing the line between sharing and stealing. In his latest post, Greg Storey from Airbag calls theft on Flickr user Allig8torx for poaching photos from File Magazine (see FM’s Untitled by Byron Barett and Allig8tor’s astica3). Several Airbag readers defend Allig8tor (the nick is becoming such a pain to type), as it is possible that he’s just using Flickr as an online repository, rather than passing the photos off as his own. Regardless of intention, the publication of someone else’s photos are a violation of intellectual property rights, unless permission is sought and obtained. But what of aggregation? Surely there is added value when these individuals scour and collect the best resources out there and compile them for the rest of us. Patrick Haney’s Web Design Inspiration, also hosted on Flickr, is an invaluable resource. The works displayed aren’t his. I doubt expressed permission was sought in these cases as well. The main difference is that Patrick attributes his sources. The URL of every site is listed; nothing was done to obscure the brand of the website. Not only does Allig8tor not name his sources or attribute the creators of the photos, he renames them in his set. It’s not exactly claiming them to be his own, but it removes all trace of ownership. Saw this t-shirt while coming to work the other day. I’m not usually a stickler for great English; I read, laugh and move on. 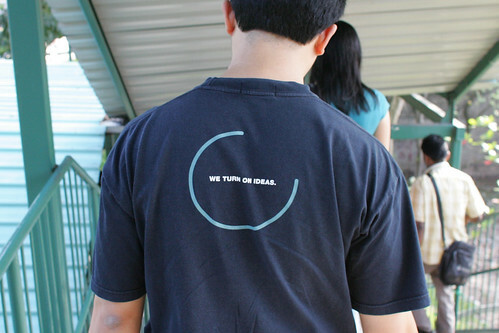 But this shirt from Seagate which says “We turn on ideas” goes from “innovative company” to “corporate deadbeat” with a switch to preposition and a change in intonation. It started with Faith wanting chicken chop and chicken wings two nights in a row. It was then I knew, even though the probability was slim. We took a test even though it was way too early to determine anything. It came out negative. So on National Day, after the minimum 28 days needed for the hormone levels to be substantial enough for these off-the-counter tests to work, we tested again. It’s almost 3 years to the day when we discovered we had Anne. It’s Wednesday evening, and I’m so wishing for a nice long holiday. 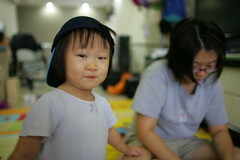 I spent last Saturday doing housework, upgrading all my sites to Movable Type 4 and coding Photolog.org. After some years of neglect, I decided to brush off the dust and put the pictures up again.